Downloadable Commercialism: You Got Your Branding in My Game! Stuff! Things! Companies make'em and they know you want'em. But are ads and promoted content in games ruining the games themselves? Or are we just a little too sensitive about our favorite franchises being overrun with not-so-guerrilla marketing? 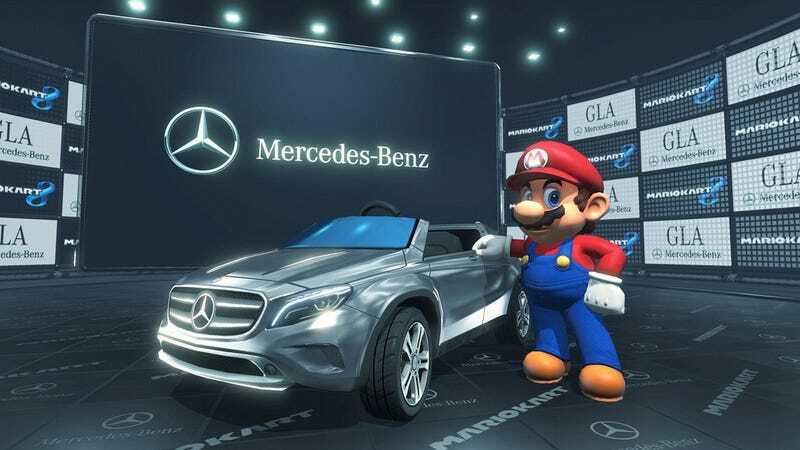 With the release of the (some how) already infamous Mercedes Benz Mario Kart 8 DLC it seems the world of gaming is at an impasse as to their feelings on promoted brands in the form of downloadable content. Some say it's gross. Some say it's fine. Some don't care as long as it's free. And while both games are so awesomely terrible in concept that they remain seared into our cerebral cortex, they are also gaming and advertising together at their worst (or best?). These are entire products made to promote a brand. But at least they're up front with that, right? You're quite aware that you're playing a game that's made by 7Up and Cheetos when you slam that cartridge into your dusty Super NES. It's not like some game about collecting snack foods and beverages is going to make or break a system. It's not going to fall under the title "system seller" any time soon. Well, maybe Sneak King... But the point is that these games are harmless and admittedly pretty hilarious. The case of Mario Kart 8 is a bit different. Mario Kart has never had any form of real advertising in-game. It's always things like "Bowser Motors" and "Shy Guy Tires" that show up on billboards and blimps throughout the series. This is not completely uncommon in other Nintendo-produced titles though, as both 1080 Snowboarding and Wave Race 64 come to mind as "sponsored games". Remember when Tommy Hilfiger was cool? Radical! For those not in the loop, Mario Kart 8 just received free and (I believe) optional DLC that includes three Mercedes Benz themed karts for Mario and pals. Do they look kinda silly in the Mushroom Kingdom world? Well, one does. The one in the middle there. It's a little too "real" for Mario Kart, though the other two offerings are both pretty close to other karts that came packed with the original game. The response to this DLC seems to be, "Nintendo is a sellout! They're pimping out my childhood franchises to the highest bidder!" But come on folks. Is this really that far of a stretch? A car brand showing up in a racing game? I mean, I know it's Mario Kart (the Mario Kart, damn it), but let's just be think this over logically. Nintendo is giving you some FREE content here. Sure it's all based on a brand, but it's not the worst step forward in the world of advertising or the world of gaming. Not to mention the fact that they're not shoving it down your throat. Mr. Clean hasn't joined Smash Bros, Link isn't questing for the Triforce of Doritos, and Star Fox isn't piloting a Toyota Prius through Sector Z. I don't think a line has been crossed. Or if it has it's not a detrimental one. If you don't like the thought of free brand based DLC then don't download it. I'm certainly going to. I'm gonna look goofy as hell drifting around corners as a giant tie-wearing ape in a fancy German whip. Things could be worse, believe me when I say that. And until they get worse I'm just going to roll with it and I suggest you do the same. Or don't! That's the joy of being a gamer. The ability to choose. Also, we're getting Link. In Mario Kart. Does that not make your head explode just a little in a good way? Not to mention five other new characters, eight new karts, and sixteen new tracks for $12 measly dollars. Nintendo (surprisingly) knows what they're doing and I don't expect them to fall prey to over advertising in their games any time soon. I guess I'm okay with a little corporate branding in my games, but let's not over do it.